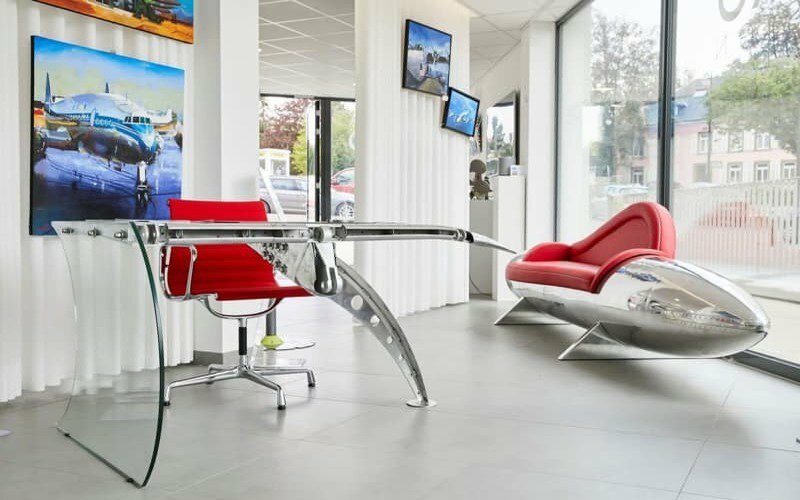 The leading European aircraft recycler, French company Tarmac Aerosave, has signed a deal with design company Aero-Design to develop a range of decorative objects and furniture that will give new life to parts of dismantled planes. Eager for an upgrade for your living space? Furniture constructed from parts of a decommissioned A380 could add the touch of class you are looking for. Tarmac Aerosave has not yet disclosed the list of aircraft models to be repurposed by Aero-Design, but the program will pave the way for the use of windows, wings and other parts of long-haul aircraft to provide raw materials for furniture from the company founded by Agnès Patrice-Crépin. The aviation-obsessed artist has already attracted attention with jewelry and trophies built from recycled aircraft parts. The French group, which dismantles aircraft at sites in Tarbes and Toulouse in southern France and in Teruel, Spain, points out that only one quarter of the planes that pass through its facilities will be recycled. The remainder are reconditioned and put back into service by new owners. Last October, the company started work on the dismantling of an A380 which had been decommissioned by Singapore Airlines.